On the other hand, my hubby loves a huge breakfast. Bacon, eggs, toast, hash browns, pancakes and juice. You know the kind of breakfast. The kind of breakfast you definitely don’t want to make at home…dishes, dishes, and more dishes. Go down to the Chute Pond Diner, that’s what I say! Even though I’m not a fan of a huge breakfast, I do love a breakfast for dinner. Scrambled eggs, omelettes, a frittata or even french toast. I can eat any of these traditional ‘breakfast’ dishes for dinner anytime. 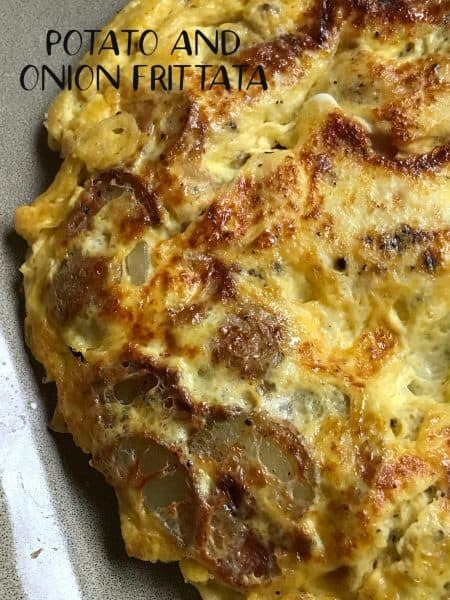 A frittata [frih-TAH-tuh] is an Italian omelet that usually has the ingredients mixed with the eggs rather than being folded inside, as with a French omelet. It can be flipped or the top can be finished under a broiling unit. An omelet is cooked quickly over moderately high heat and after folding has a flat-sided half-oval shape. A frittata is firmer because it’s cooked very slowly over low heat, and it’s round because it isn’t folded. If your looking for more breakfast recipes to serve for dinner, we’ve got you covered. Check out these recipes too. Asparagus Frittata and Mediterranean Frittata. Perfect to serve for breakfast, lunch or dinner. In 8-inch nonstick, oven-proof skillet or cast iron skillet, over medium-high heat, sauté potatoes, onion, garlic, salt and pepper. Pour egg beaters evenly into skillet over potato mixture. Cook, without stirring, for 5-6 minutes or until cooked on bottom and almost set in top. Place frittata 3-inches under broiler. Cook 2-4 minutes, with door ajar, watching carefully, until top is golden brown. 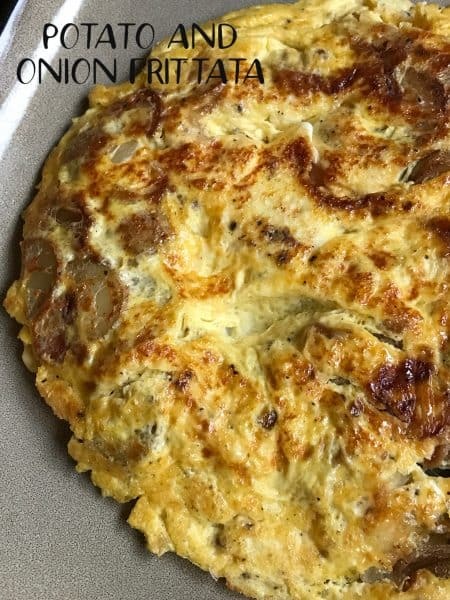 Carefully remove frittata from oven and slide onto serving platter or place serving platter on top of skillet and flip over.